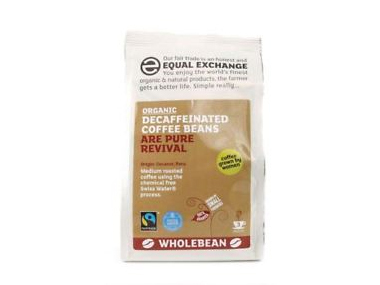 Buy Equal Exchange organic and fairtrade decaffeinated coffee beans - 227g in the UK from our online shop or directly from our independent Scottish store. Decaffeinated medium roast coffee beans using the chemical free Swiss Water process. Coffee grown by women. Fairtrade, organic and whole coffee beans. Strength 3. These organic decaffeinated coffee beans are pure revival. Decaffeinated using the harmless Swiss water process. No chemicals were used to decaffeinate this coffee. We sell real Equal Exchange and other Coffee Ground & Beans directly from our shop in Scotland and online throughout the UK. Where can you buy real Decaffeinated Coffee Beans safely online? If you are wondering where you can buy Equal Exchange organic and fairtrade decaffeinated coffee beans - 227g safely online in the UK, then shop with us. We are an actual health foods shop; with real people selling real foods and products. Our award-winning independent shop is located in Stirling, Scotland since 1976. You can buy our Coffee Ground & Beans in store or safely place an order with us online or over the phone. Decaffeinated Coffee Beans - Equal Exchange organic and fairtrade decaffeinated coffee beans - 227g in Coffee Ground & Beans and Drinks.